Recently, I made two pretty big investments in my amateur food photography endeavors: I bought a Lowel Ego digital imaging fluorescent light and a subscription to Adobe Photoshop Lightroom. Given that still-life photography is such a huge part of many blogs and given that each of these investments was fairly pricey, I wanted to write a post reviewing each of my new investments, hopefully to help those of you wanting to improve your photography to decide if either investment is right for you. The photograph below was shot using my Canon EOS Rebel t6i DSLR, on my kitchen island at night, using the Lowel Ego light (not diffused). The top half of the photograph is exactly how it came out on my camera, while the bottom half has been processed using Lightroom. When I started the free trial of Lightroom, I was skeptical that it could do much more than a free iPhone app. I feel like this photograph alone proves me wrong. There is no way I would have been able to achieve that kind of white balance and added vibrancy on my iPhone. I honestly don’t even think I realized how dull the original photograph looked until I edited it in Lightroom. The colors look so much more colorful, the white so much whiter — everything just looks better when the use of my Lowel Ego light is complemented with good post-photography processing. So, what about comparing the lighting to not using the lighting? The photograph below was shot twice: once with the Lowel Ego light on, and once with it off. Neither photograph has been edited. 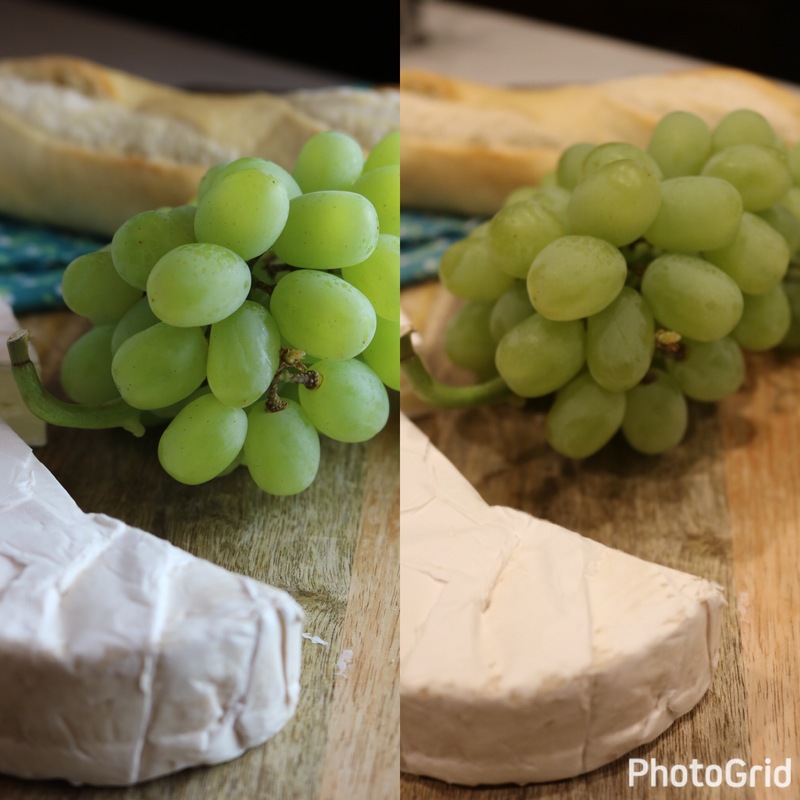 As you can see, the light alone brought out the white in the brie’s rind, as well as the details in the surface of the grapes. Without the light, you can really tell that it was nighttime in my kitchen. The food just looks dull and lifeless! Now, I wanted to end this post with a comparison of all four permutations on the same photograph: no light or editing, no light but edited, light but no editing, and light with editing. Looking once more at these photos side by side, I am amazed (though not surprised) at the results. The unlit, unedited photograph (top left) is about as dull and lifeless as we would expect, despite using a fancy camera. Moral of this photograph: A DSLR alone does not guarantee a fantastic photograph. Looking next at the photograph without the lighting but that was edited (top right): I honestly feel like editing alone did very little to help this poorly lit photograph. All the editing did was make the grapes a bit brighter. Otherwise, the photograph looks very yellowed! Moral of this photograph: A DSLR and sophisticated editing software still does not guarantee a fantastic photograph. Now, onto the photograph using the light but not editing (bottom right): Here is where I feel like I can really see some positive improvement. The grapes look delectable, and the bread doesn’t look yellow. Moral of this photograph: A DSLR and proper lighting works wonders! Finally, looking at the photograph that had the lighting and the editing (bottom left): I love how vibrant and delicious the food looks. The colors all look so real, not washed out or yellowed. Moral of this photograph: A DSLR, proper lighting, and post-processing really does pay off! So, if you have got about $100 sitting around to invest in your still life photography, I personally recommend investing in a good light before investing in processing software. While they both will do wonders, I think it is clear that the lighting alone will go a long way, while even the fanciest software cannot fix poor lighting. Photoshop isn’t a miracle worker, after all! Tell me, what are your thoughts and experiences with lighting and editing still life photography? Aww, thank you! 😊 I might start putting some recipes up on the blog so maybe more food photography in a near future… I look forward to seeing more of your photography too! I always enjoy reading your articles and keeping up with your blog. Yeah, I’m a bit addicted to Etsy… 😉 Did you find some nice presets? I did not end up purchasing any presets yet. Still haven’t pulled the trigger! Amazing really enjoyed your review and practical use for these two new investments. Wow! This is incredible!! You can really see the differences when you have the right lighting! I know, right?! It really is crazy how much of a difference lighting (and to a lesser extend, editing) makes. I’m so glad that you made this post! I’ve been thinking about investing in a light recently and the comparison photos are really helpful! Thank you, Paige! I am glad you found it helpful!! I still can’t believe what a difference it made. It’s amazing what lighting and editing would do. I’m currently researching lighting myself (literally lol) in terms of what I’m going to use to light myself when I make videos. It really does make a difference. It really is amazing! It’s funny, when I first started teaching myself photography, I would often hear that the hardest thing to get used to is that the way our eyes see the world around us is not the way the camera sees it. Our eyes naturally know how to adjust what we are seeing, while the camera doesn’t, which is why we are often disappointed with the photo that comes out. Once I started understanding the importance of lighting, it really opened my eyes (no pun intended). Not. At. All. I’ve seen some glorious sunsets, but when I try to capture them on my phone, it just doesn’t compare to what I’m seeing. I remember reading an article that tried to figure out what type of camera our eyes were, but because of exactly what you said above, it’s really not possible to do so. Our irises automatically adjust as do our lenses to filter the light and clear up the picture respectively (unless you’re nearsighted like me and need glasses hehe). Lighting is so important. It’s why the next thing I purchase after I get my webcam is going to be proper lighting! Thank you so much for the helpful advice about cards! I greatly admire your photography, so I will happily accept any tips of the trade that you have. It is so true that so much time is spent setting things up and not actually shooting! Fantastic to see those comparison shots side by side, your investments were definately worthwhile ones! Thanks!! The side by side comparison definitely made me confident in the investment. I just found you and am very interested in getting into food photography. I’m new to the blog world, so this is a great find! Can’t wait to see more. Thanks!